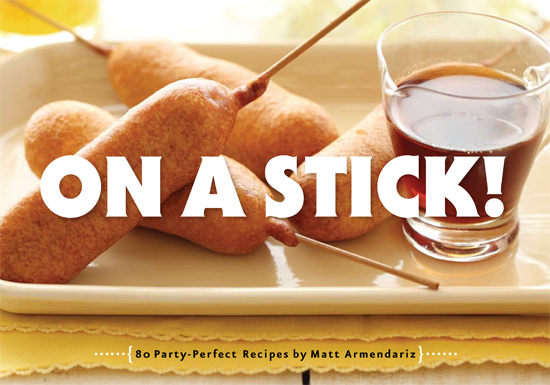 I am so proud of Matt, of Mattbites, for his new book On a Stick! It’s fun, quirky and not a little bit silly – I love that it’s a lot silly in the most stylish and sophisticated way possible – not unlike the man himself. 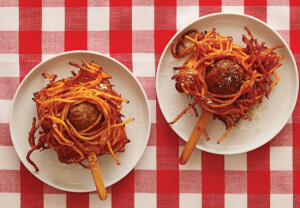 I mean why put spaghetti and meatballs on a stick other than to show that a. yes it can be done and b. Adam (fabulous food stylist) can style anything? I love the look of this book and that’s not a surprise given the author’s background – and the fact that his partner is the aforementioned fabulous food stylist. 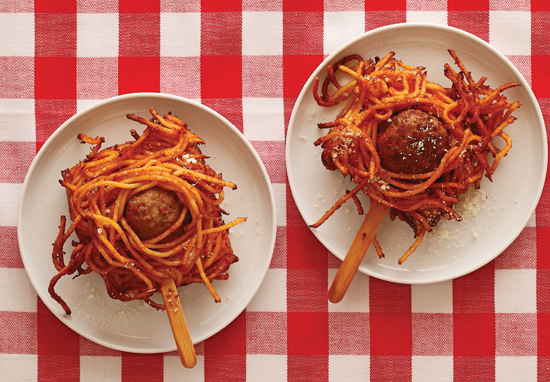 The recipes have been properly tested and work – there are several that will be used again and again when I entertain, although I’m hoping I’ll be entertaining Matt and Adam and they won’t be too critical of my less than stellar presentation and just enjoy the food. I am on day 5 of my 30-day make over and today I was feeling a little bored already. It’s not that the recipes aren’t tasty and varied – they are, and I’m adapting them as I go to make sure they get better. I have been enjoying the process and especially the discipline of it all. I even downloaded a few new dance numbers to my iPod this afternoon to up the anti on my boogie. My niggle came from a craving for the chocolate pudding from day 1 which like an itch that just won’t go away I’ve found impossible to ignore. Snack today is a beet salad with oranges – delicious but just not a chocolate pudding. I made up double the recipe and put the finished pudding into 4 tall glasses and carefully transferred them to the freezer. 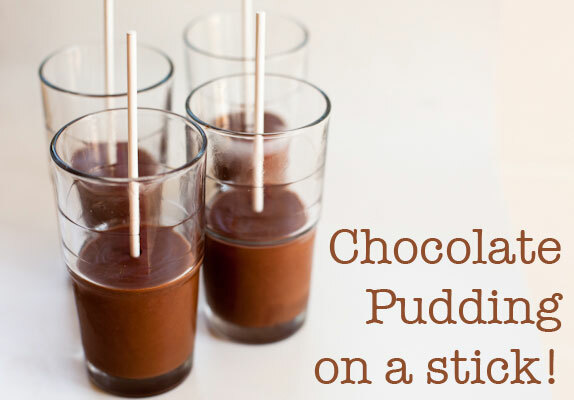 After about 30 minutes the pudding was beginning to solidify and I popped in the lollipop sticks, being careful not to push the sticks all the way to the bottom. Within a couple of hours it was tea time which meant time to try my frozen treat, which by now was really frozen solid. I carefully held the bottom of the glass under hot running water for about a minute until the edges were softened and the popsicle slide out of the glass – er HELLO?! Here it was in all it’s glory – and thank goodness I had made four. Minty and Rémy were intrigued and of course wanted one as well. 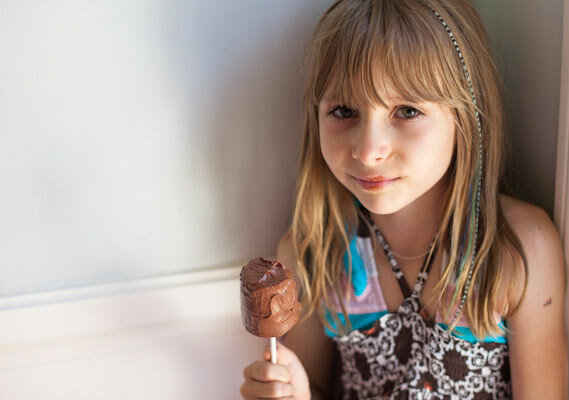 Rich, creamy and transformed into delicious chocolate ice cream on a stick this chocolate pudding took on a new life. The flavor reminded me of the homemade full fat creamy ice cream of my childhood. I had achieved the impossible, the craving for chocolate pudding was gone, so 4-days-ago. 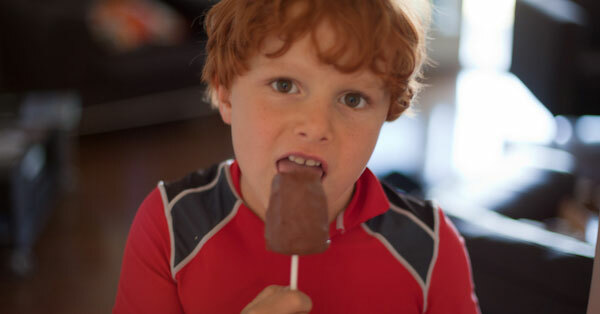 My new craving – this frozen on a stick delight – the Matt Armendariz ChocoPuddingPopsicle. Nothing I make tomorrow for snack will compare, stick or no stick, although Honeydew Grape Salad on skewers does have a certain appeal. 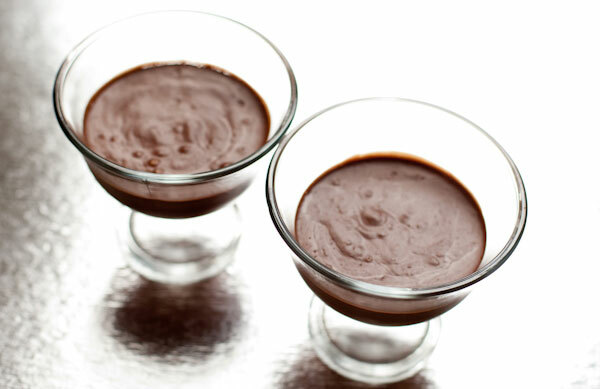 This is a fabulous recipe, especially when you realize it’s vegan (not a fan of when vegan’s make dessert – there’s usually something chalky in the underlying consistency). Not this pudding – it’s deeply satifying and will make you feel sick if you eat more than the prescribed serving. Oh wow. This is right up my alley. Looks delicious! Love Matt, love that book of his. 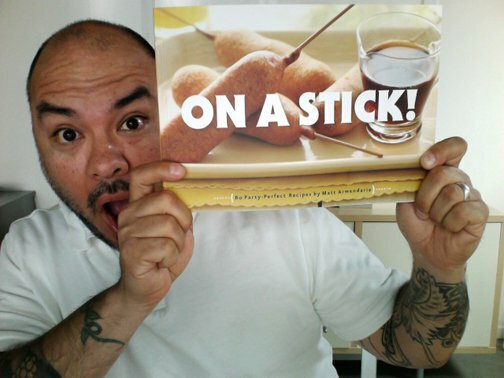 Count me in for some pudding on a stick! What a fun treat for summer!